Adventure Time: The Complete Fifth Season: On Blu-Ray & DVD Today! 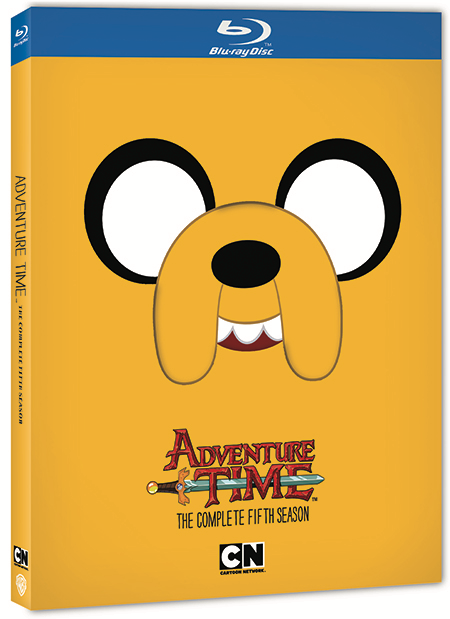 Adventure Time: The Complete Fifth Season Comes to Bluray/DVD Today! Adventure Time: The Complete 5th Season is on blu-ray/DVD today, and my kids are rejoicing! For one thing, my kids are crazy about the clever, animated series, and there are also FIFTY-TWO (52) episodes in the set with a collective run time of 572 minutes (9.5 entire hours)! Cartoon Network's Adventure Time is wonderfully imaginative, and features Finn and (shape-shifting dog) Jake, as they voyage through the Land of Ooo and meet its citizens. Previously, I wrote about Adventure Time: Frost & Fire, which my kids enjoyed immensely. It's definitely worth looking into too. Watch a VIDEO clip of Adventure Time: The Complete Fifth Season, below. Are your kids or grandkids fans of the Adventure Time series? What cartoons are the kids currently watching in your household? I haven't heard of Adventure Time before, I'll have to check it out on CN next time it's on. Great gift for the nephews! Oh! I haven't heard of Adventure Time before, but it looks like something my nephew would be interested in! Going to check it out more and also pass this on to my sister-in-law. I haven't heard of this. I'll look it up on our next rainy afternoon as my son loves show with dogs in them! Minions Movie Review! Life Before Gru!